On the street in Cozumel I saw a big sign saying, SCOOTERS FOR RENT. My first thought was mobility scooters for people who needed some help walking around. Then a Vespa-type scooter whizzed by. Ahhhhh! Melissa took this picture of the warning sign posted where you rent these scooters. You probably also ought to know the traffic laws! 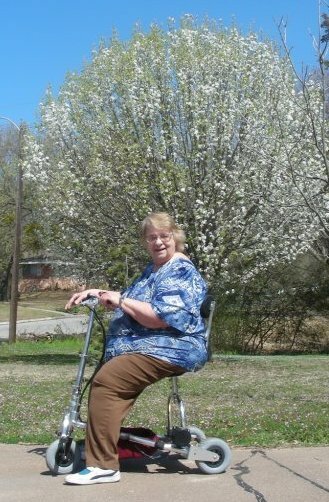 Rhonda very kindly loaned her scoot to Melissa for the cruise. Before we left Baton Rouge I jokingly promised Rhonda I wouldn't let her scoot drink too much. 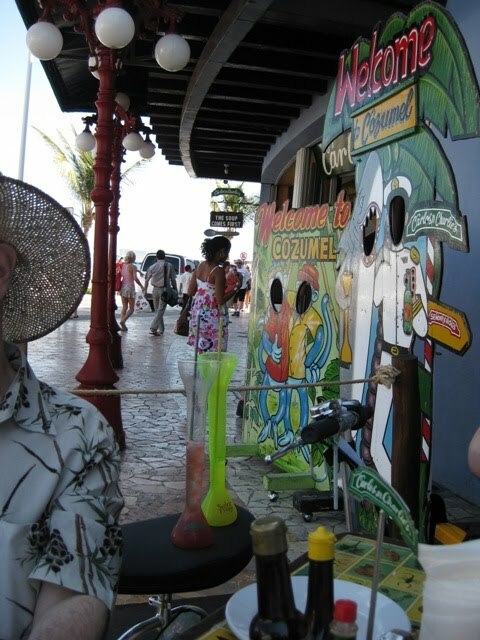 But when in Cozumel, just how much is TOO much? The nachos were yummy too! Does anyone have a pair of scissors? Gee, I've done three posts in a row without a TravelScoot picture. That's a record! Of course you wouldn't have seen those three posts though if it hadn't been for my TravelScoot. I'm going to start this post with a few words of advice. TAKE YOUR TOOLS AND A SPARE BELT WITH YOU, and don't just leave them on the ship like we did. Some day you'll be glad you were prepared. One thing I had NOT planned on (and the reason I am advising you to keep your tools and a spare belt with you) was my dress getting caught in the belt. I often scoot in dresses and have never had a problem before, but this dress was a little longer. All of the sudden I'm scooting along and BAM, I'm not moving anymore. It took several minutes for Alan to work the fabric out of the belt and we did it by rolling slightly forward and back until he was able to get it out. We thought we were going to have to resort to scissors, but luckily we didn't have to do that. The fabric was torn, but at least I was still rolling! Isn't that Walmart bag fashionable? At least it matches my dress! 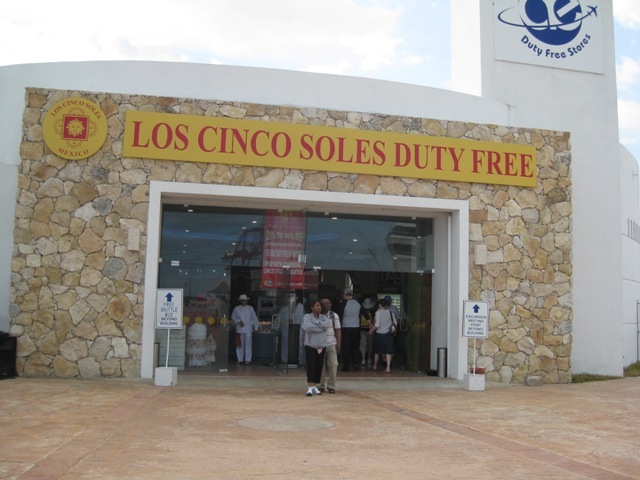 As soon as we entered Cozumel we were again immediately presented with MANY shopping opportunities. We found a small elevator to take us to the second floor which is where we had to go to enter the mall. The shopkeepers were urging us into their stores here too, and we heard many more offers of "Free Parking, Free Parking!" 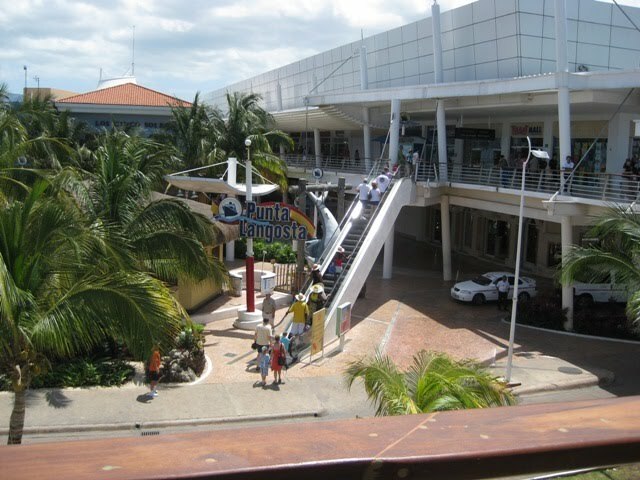 When we got to the back of the mall we wanted to go down to the first floor so we could go into Cozumel. The only elevator we could find was broken. While Melissa, Alan, and I were contemplating what to do, a local man came up and pointed down to see if we were needing to go down. We nodded yes and he motioned for us to follow him. He took us down one hall to the back of the mall and then into a back door of a service area. At some point my life started flashing before my eyes because I didn't know this man and didn't know where we were going. We went down another hall and stopped when we got to a huge freight elevator with heavy steel doors. He manually opened the doors and then motioned us on. I was very happy to see the light of day again AND have my heart resume beating. Off we went exploring the streets of Cozumel. We got past the mall and enjoyed some of the local shops, some in buildings and some in open areas in alleys. It was mostly the same souvenier types of items over and over again, but we also saw some beautiful and unique items. I fell in love with a very colorful handcarved round tabletop painted in many bright colors but it was too large to transport home and we really had no where in our house to put it. You could buy Cuban cigars (but it's illegal to bring them back into the US), "Rolex" watches, and a whole host of diamond and tanzanite jewelry. The most popular item for the travelers I was with was Mexican vanilla, which is sold in many different size bottles. We came back with a liter of it which we paid $8 for. The woman who sold it to us asked me twice to tip her to pay for her chicken tacos. Lots of workers (mostly in entertainment areas) wear big buttons asking you to tip them. I really had to learn when to say yes and when to say no. The second picture was taken in an alley off one of the side streets of Cozumel. Alan and I thought the wiring was interesting. The third picture is of a local pharmacy where you can buy "prescription" drugs without a prescription. I'd heard you could do this but seeing it in person was eye opening! 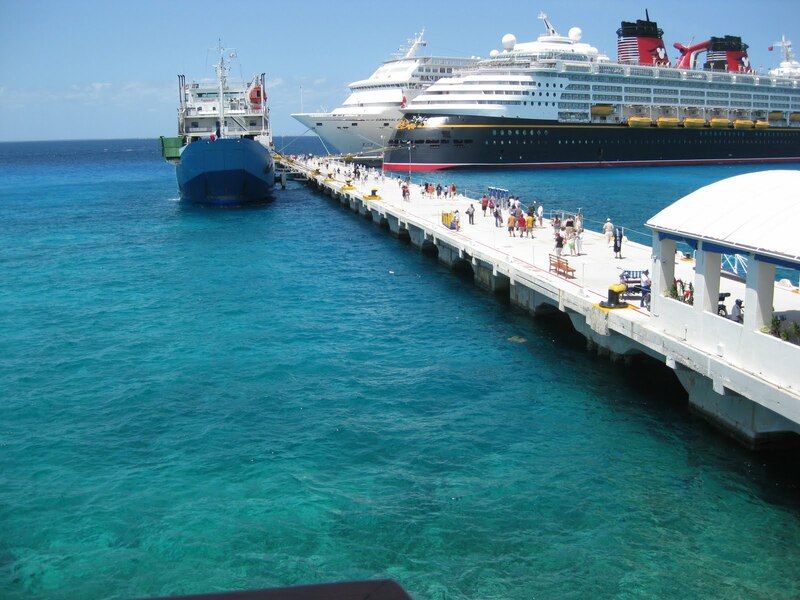 These are pictures from when we docked in Cozumel. The first is taken from shore and gives you an idea of part of the walk from the ship. 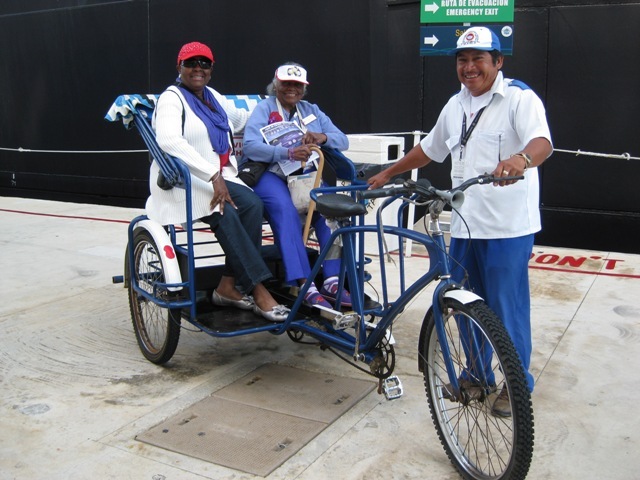 The second shows a bicycle taxi with two lovely ladies who let me take their picture. 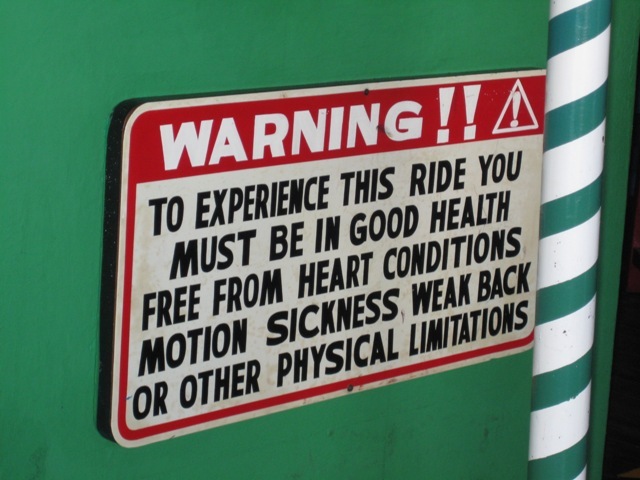 These drivers work only for tips and get passengers from the ship to the dock. I'll bet they have some incredibly strong leg muscles! If you click on the first picture to make it bigger, you'll see how amazingly clear and beautiful the water was. I always thought the colors I saw in the postcards were fake. I was wrong! The Blue Sapphire Theater officially seats 1200. 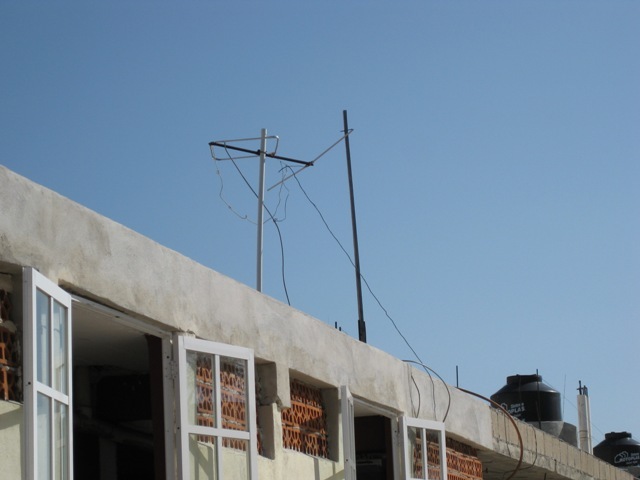 It can be accessed from two levels of the ship. Both these pictures were taken from the second level. There is size friendly AND scooter friendly seating all over the place. If you're using a scoot you'll probably prefer the first level, which is all handicap friendly, but if you're on the second level, there's this special handicap area available too. This is where most of the shows are, but also things like bingo and the towel folding workshop, which was surprisingly fun! One of the highlights of the cruise for me was Cruise Director Steve Cassel's debarkation talk, where he explains what you do to get off the ship. We gots lots of helpful information from that, but I also laughed harder than I'd laughed in months as he told us the top ten stupidest questions every asked by Carnival Cruisers. ("What altitude are we cruising at?") Steve is an exceptionally funny guy. 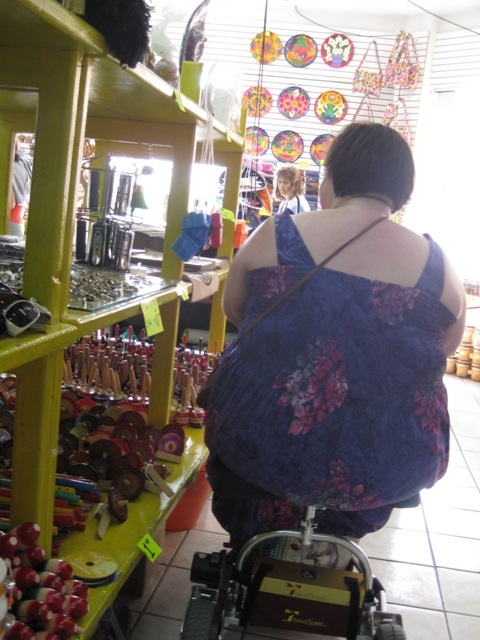 On our day in Progreso, Alan headed off to an excursion to Chichen Itza which left me and Melissa to explore shopping opportunities. Here we are headed off the ship. 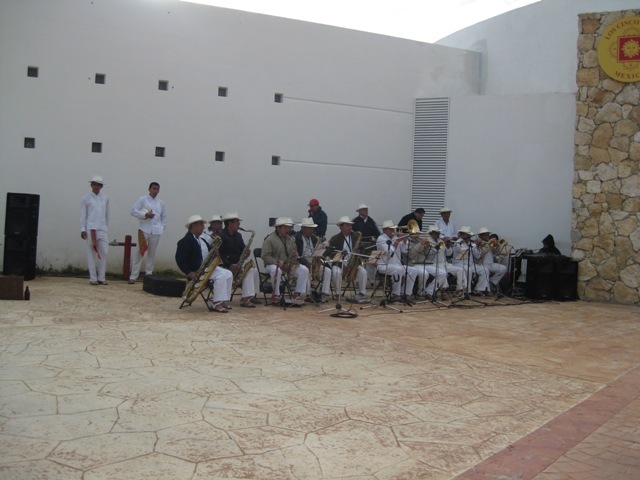 We are greeted by a local band, playing to set a festive mood. Here's a look back at the ship from shore, to give you an idea of the distance to the first store. 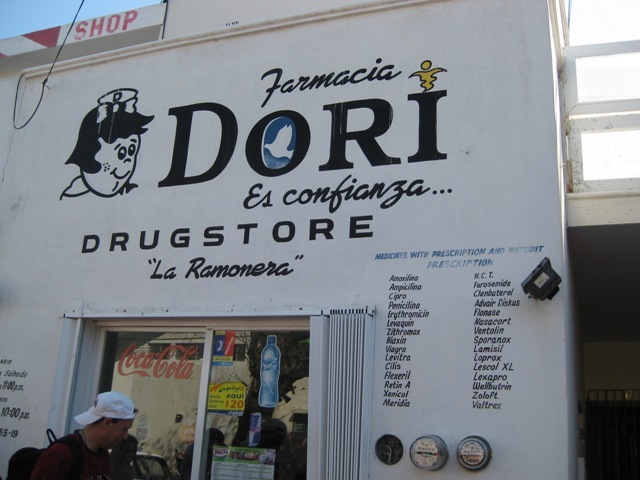 You have to go through this store to get to ANYTHING in Progreso, including transportation to the excursions. There are many employees inside to help you shop. This is where I began learning to bargain on prices. I bought a beautiful turtle made of obsidian. Once you go through the big store there's a whole mall of stores. Many of them have small ramps to get inside. Otherwise you'd need to take a small step up to get in. Prepare yourself because you will hear "free parking!" at least a dozen times as the shop owners try to entice you into their store. We shopped for a couple of hours and then headed back to the ship. I didn't even realize until I was looking at the pictures that I was ignoring the "don't walk behind red line" warning. Obviously I didn't think it applied to scooting! We attended the Southdown Marketplace in Houma, Louisiana. It's one of the largest handcraft shows in the state, with over 300 vendors. I could not have made it without my TravelScoot. I was able to ride on grass the entire time with no problems. 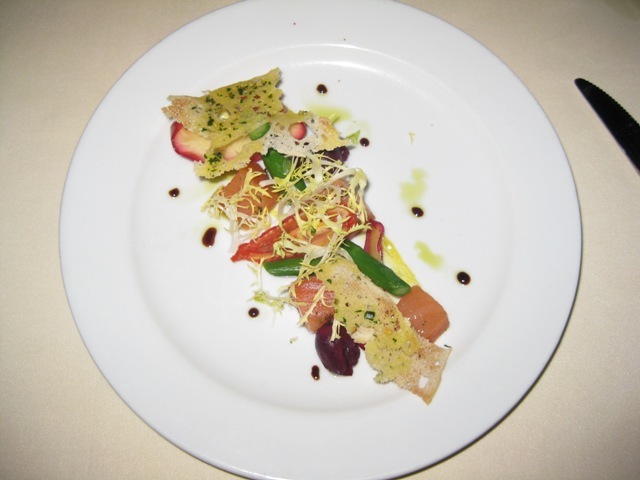 As anyone who has cruised already knows, there is no shortage of food on a cruise. As soon as we were on board (and feeling a bit lost!) we followed the flow of people and ended up on the Lido deck for a buffet lunch. There was one tricky incline Melissa and I had to make it up to get there, and I got better at it the more times I tried. The trick was getting a good running start, especially since I couldn't approach it head on. Towards the top I put my feet down to help make the last little bit and every time I did it I let out a little cheer on the other side. 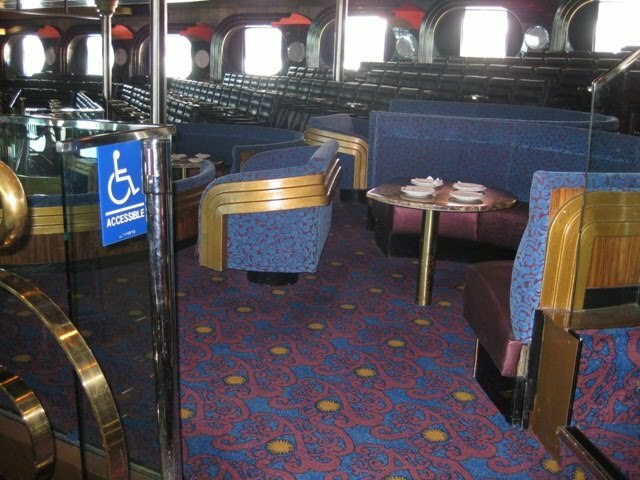 There are tables and chairs set up in the buffet area, or you can eat on the Lido deck. The only problem I encountered is that the chairs in both these places were uncomfortable. The crew is very accommodating though, and when I asked for armless seating they went and found a chair and brought it to me. They also offered to carry my tray from the buffet without me even asking. 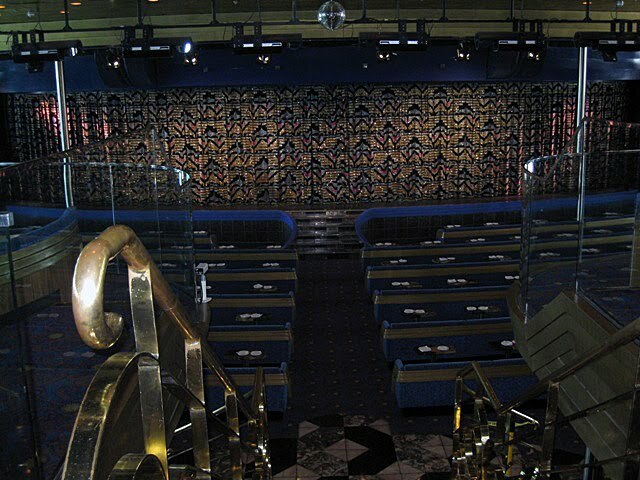 Alan and I prefer restaurant dining over buffets, so we had most of our meals in the Windsong or Windstar dining rooms. Carnival, if you're reading, please change the name of one of these restaurants. It is so confusing trying to remember which is which. There was always a place not far from the table for my scoot. I didn't want it out of my sight so that worked out very well. 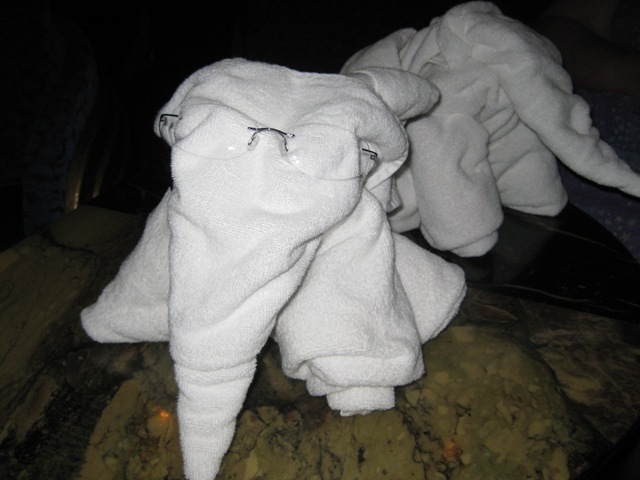 Once we arrived at the Galveston port for the first day of our Carnival Ecstasy cruise, we loaded our scoots with tote bags and a small case each, and got a porter to take the big luggage from the car and get it checked in. I left my Peterboro basket at home (a good decision), had my CrampBuster in place (another good decision), and off we went to start our adventure. 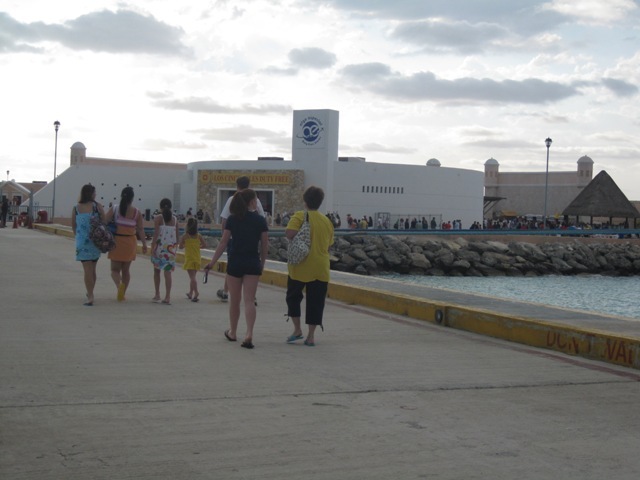 The embarkation process amounted to waiting in long lines to jump through the necessary hoops to get on the ship. There were lots of employees around to help us from one place to the other, and because we were on mobility scooters our party of 4 was taken to different (and much shorter) lines. There is a LOT of walking and standing in line involved before you're on the ship. This was a case where having a scoot (or a wheelchair, walker, or cane) gets you extra assistance. 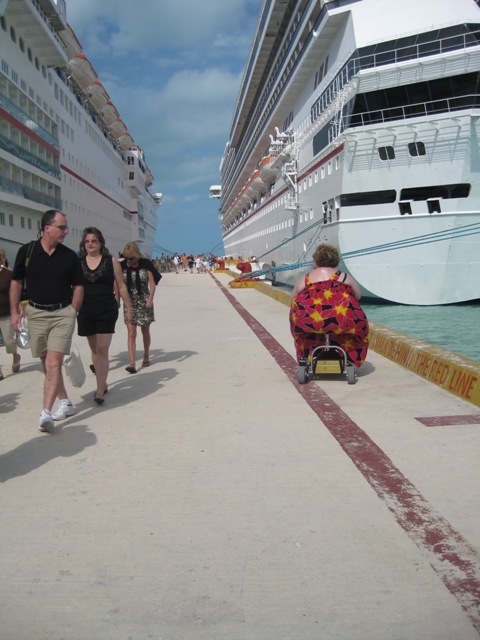 A side note: If you are in the process of deciding if you need a TravelScoot for your cruise or not, please know that in addition to the walking, there really is a lot of standing in lines involved in checking in. The scoot gives you an instant place to sit. The last thing you have to do before you're on board the Ecstasy is make it up the final ramp. It's not a long or particularly steep ramp but it is narrow and the beginning and the end parts aren't connected firmly to the middle. Melissa, daring woman that she is, tried to drive her scoot on. Uh... no. We both ended up getting off the scoots and walking on and getting the scoots on separately. Our rooms weren't immediately ready, but we were able to get into them within about an hour of boarding. The narrow hallway leading to our room was carpeted but it was easy on my scoot. I mention this because hotel carpet is often plush and causes the motor to have to work harder and the battery to drain quicker. If there was no luggage, carts, or people in the hallways, two TravelScoots could probably sit side-by-side, but that is RARELY the case so there's a constant need to dodge, drive around, and avoid people who open doors and run out without looking. We had an outside cabin, which means it had a view of the water, but it was not a handicap accessible cabin. I really hoped we'd be able to get my scoot in without a lot of trouble, but it just did not fit through the narrow doorway without being folded. This meant that every time we entered or left the room we had to assemble or unassemble it. 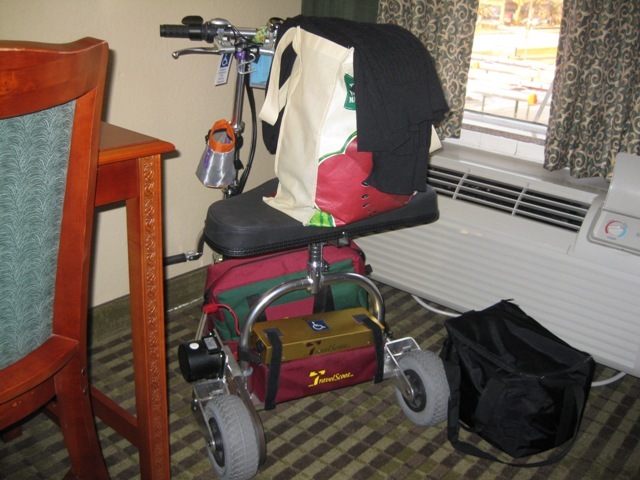 I was under the misconception that handicap room had wide doors, roll in showers, and lots of other cool things for folks on wheels, and I didn't want to deprive anyone who truly needed those features of the room. I was able to actually go in a handicap cabin and found that yes, the door was a few inches wider and there wasn't as high a step up into the bathroom, but other than that things were the same, including the size of the room. I will most definitely request a handicap cabin the next time I travel. 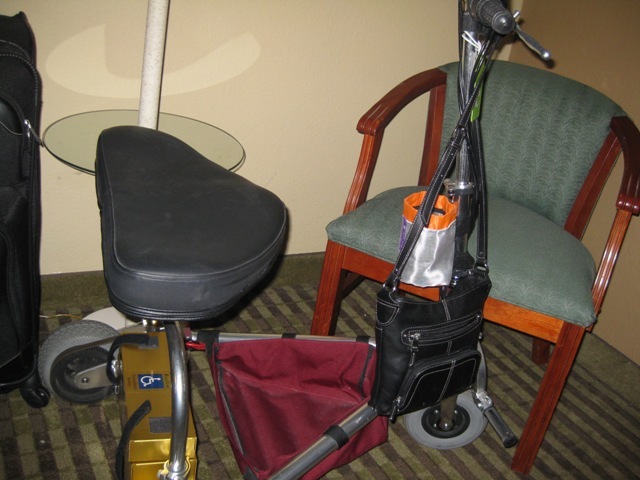 Once we were in the room we unpacked, got the batteries set up to charge, and parked my scoot in the corner. Our cabin only had ONE place to plug in a single item, so put a power strip on your list of items you MUST pack for your cruise. 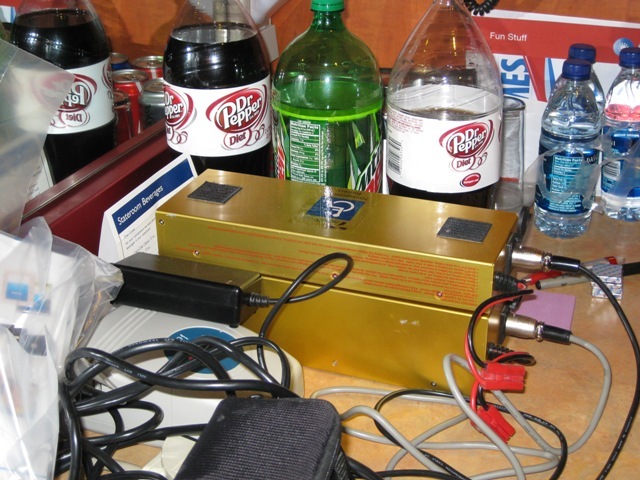 The messy picture shows the counter where we charged the batteries. The other shows the corner we used to store my scoot. This picture was taken after one of the times when we were able to get it just right and tilt the scoot in a way where we could get it in without breaking it down. We gave up on being able to do that consistently and just folded it each time. There was plenty of room to walk by the scoot and walk around the bed. If you need every inch of floor space you could also fold the scoot and put it under the bed. That's also where we put our empty suitcases. Two TravelScoots, Four Adults, and Two Queen Beds -- Thank you LaQuinta! 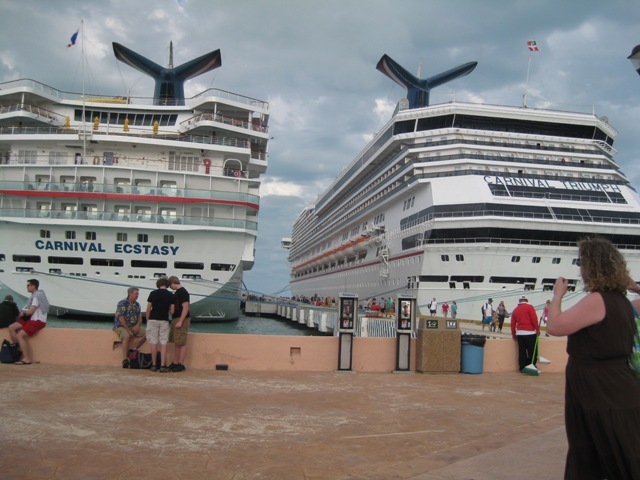 We embarked on the Carnival Ecstasy on 3/20/10 out of Galveston. "We" is my best friend Melissa and her husband Greg, and me and my husband Alan. 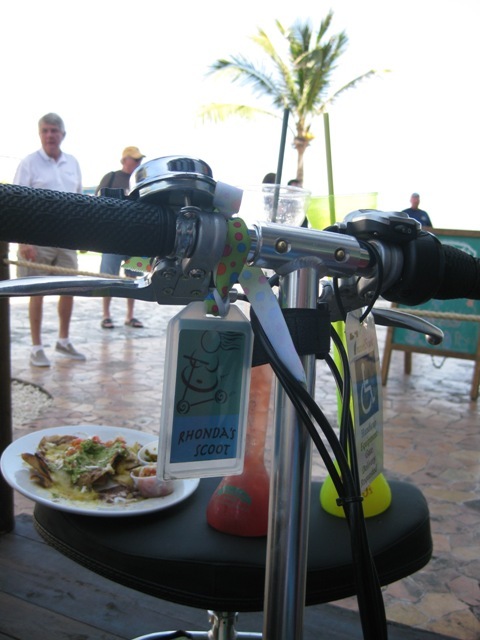 Melissa is not normally a TravelScoot user, but she borrowed Rhonda's for this trip. 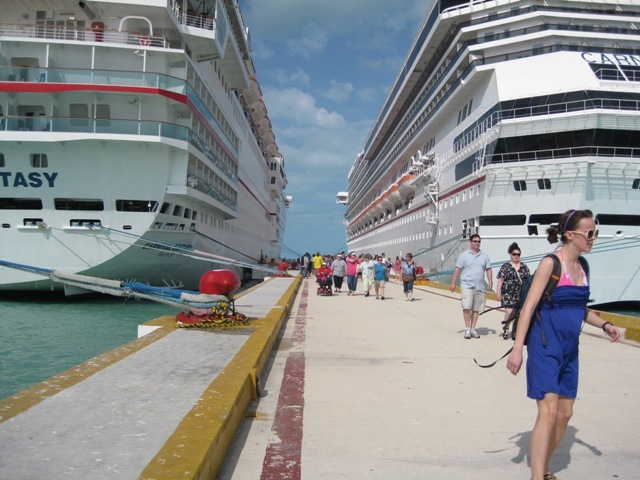 She only used hers for boarding, our days in Progreso and Cozumel, and briefly on the ship. I used mine all the time. Our cruise was part of the Big As Texas assembly, which is a conference for large people and those who love them. The night before the cruise we stayed in Beaumont, Texas in a LaQuinta Inn. We had one room with two queen beds for four adults. 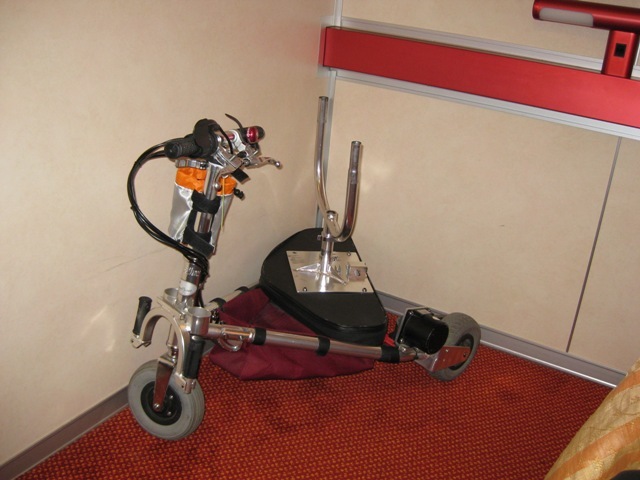 We ALSO had all our cruise luggage in the room and two fully assembled TravelScoots and we still had plenty of room to get around. That's Melissa in the photo above, and if you look closely you'll also see one scoot in the left corner and one in the right. The scoot with the tote bag on the seat has an SLA battery on the bottom of the stack and the regular size lithium ion on top. The other scoot (mine) has the large lithium ion battery on the bottom and the regular one on the top. As you'll see, they also make great places to put stuff! Would you like to follow this blog on Facebook? There are comments being made on Facebook that you don't see here, both from TravelScoot users and people who are interested in the TravelScoot. To follow this blog on Facebook you'll need to be my Facebook friend. You can search for me by using my email address, elizabeth@ifisher.com . Please let me know why you're adding me as a friend, so I don't ignore your invitation. R. Kay had a question about charging her lithium ion battery and she sent in the following response she received from Tony at TravelScoot. This is in reference to the regular size lithium ion battery. "It is vital that the charger be plugged into the wall power outlet first, then the battery into the charger. When the charger is plugged into the power outlet, both lights on the charger will flash briefly, and the left light will then remain illuminated. This indicates that the charger is getting power. When you then plug the battery into the charger, the light on the right will illuminate steady red until the battery is charged. At this point the light will turn green. Don't leave the battery hooked to the charger when not in use. If the battery is not being used for a longer period, charge it up every couple of weeks. Hope this helps." 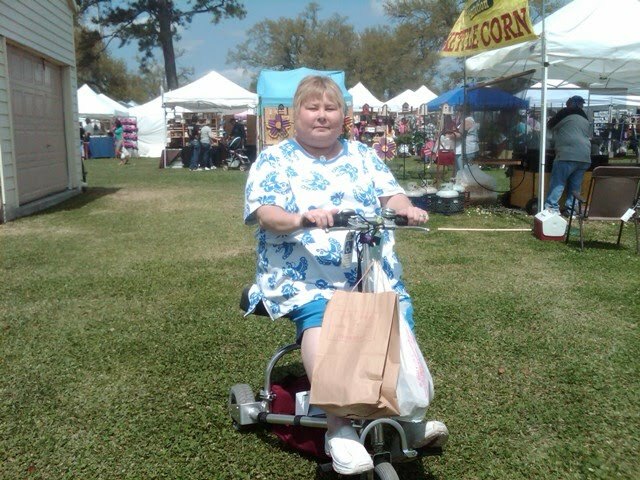 R. Kay is new to the TravelScoot world and would like for us to know that her new scoot works great in Texas! I just got home a few hours ago from my very first cruise. I have so much to say but I want to start off with a picture that says a thousand words. 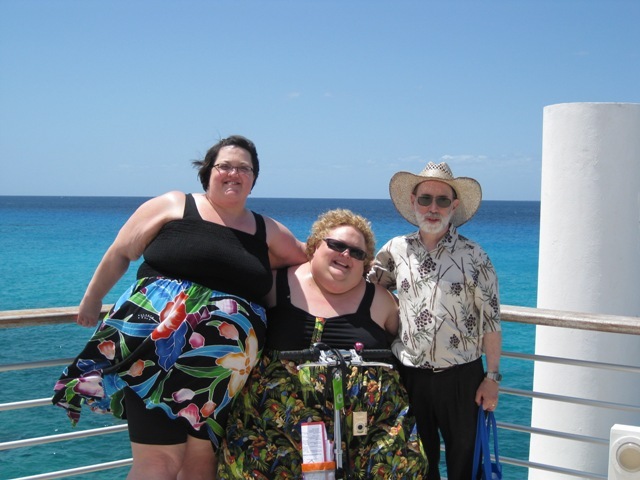 The background is the Caribbean and the picture was taken on shore in Cozumel. I would NEVER have made this cruise without my TravelScoot. 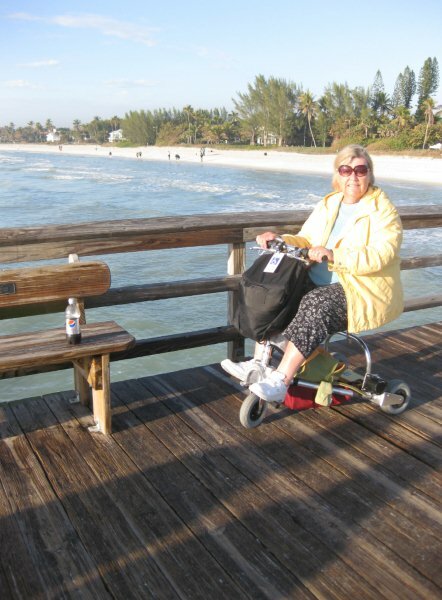 Here I am on my TravelScoot at the pier in Naples, FL...post cruise! The bag does look a little large...no wonder I landed in the post hole in Aruba! You can probably tell that it wasn't all that warm when we were in "sunny FL"....All I had for warmth was one sweater and a windbreaker I brought for our cruise! All I can say is that...with my back and hip issues....the TravelScoot was a godsend on our cruise..pre and post cruise, too! 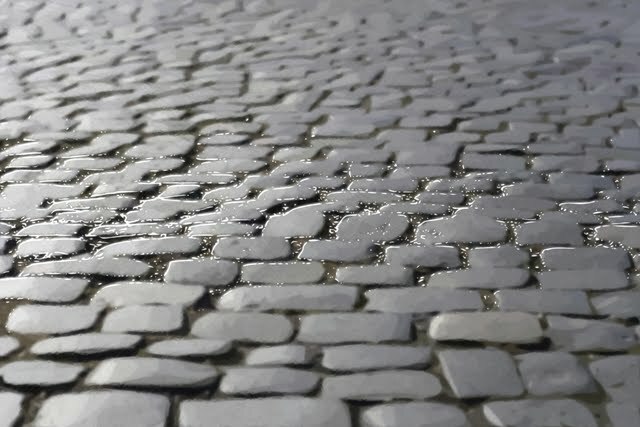 Cobblestones. How well does the TravelScoot do on surfaces such as one finds in Europe? I have a friend whose sister is considering renting a Scoot for a trip to Ireland, and she's wondering how it will do on cobblestone roads. 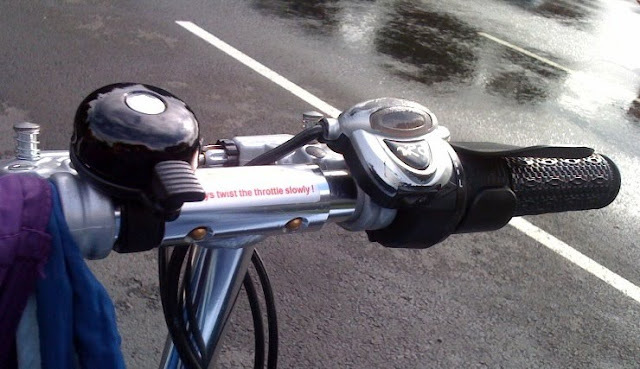 I have taken my Scoot on some bumpy rides, as well as well-packed gravel and short grass. and there is certainly a certain amount of wear and tear and athletic challenge in going over uneven surfaces. I got my CrampBuster at the end of the week and used it a bunch on Saturday. what a sweet addition to my collection of accessories. 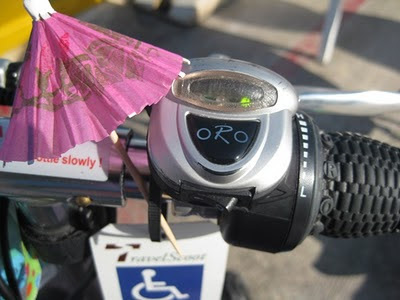 it really does make running the TravelScoot easier, and easier to use left-handed if I happen to need my right hand to open a door or something. I got the wider black one, but I wonder if sometimes it might be nice to have the narrower one. They are so inexpensive that I might get a narrow one too.